Endometriosis, the presence of endometrial tissue outside of the uterus, is a frequent, estrogen-related condition, affecting approximately 176 million women in the world, or 1 in 10 women between the ages of 15 and 49.1 The condition may lead to infertility in 30 to 50% of those diagnosed,2 as well as multiple types of related pain including: dysmenorrhea, dyspareunia, intestinal and bowel pain, dysuria, and chronic low back and pelvic pain. The management of endometriosis-related pelvic pain requires medical and, at times, surgical therapy.3 Medical modalities are directed at relieving pain through various mechanisms, including the suppression of: inflammation, cyclical ovarian hormone release, estradiol, and menses. Surgical treatment may be used as a first-line approach or after medical failure. Surgery may consist of a variety of techniques including: fulguration, excision, or ablation of endometrioma implants, as well as resection of rectovaginal nodules, lysis of adhesions and nerve pathways interruption.4 It should be noted that clinical staging of the disease often assists in the selection of treatment in a given case,5 and may include: Stage 1-Minimal, Stage 2-Mild, Stage 3-Moderate, and Stage 4-Severe. The stages are dependent upon the presence, location, extent and severity of endometrial implants, endometriomas, and adhesions. The following case presents a woman with severe, chronic lumbosacral and pelvic neuropathic pain due to Stage 4 endometriosis-related endometrioma implants, after undergoing multiple surgical interventions that failed to improve her pain control, wherein she is then successfully treated with cross-linked hyaluronic acid (CL-HA). The diagnosis is supported by electromyography (EMG) findings of multilevel lumbosacral radiculopathy6-8 and a negative imaging workup for other causes. The use of CL-HA to treat neuropathic pain was initially presented at the 2015 annual meeting of the American Academy of Pain Medicine.9 This form of treatment is designated as Cross-Linked Neural Matrix Antinociception, or simply XL-NMA.10 CL-HA is made of chemically cross-linked hyaluronic acid – a linear, anionic proteoglycan polysaccharide composed of glucuronic acid and N-acetylglucosamine repeating units. A 41-year-old woman, G, P, M, A: 4, 2, 2, 0, presented with persistent, worsening pelvic and low back pain that she described having for 15 years. The pain would intermittently radiate down both lower extremities, right greater than left, and up her lower back. Overall, her pain was worsening; it had persisted daily for the past six years, with localized pain over the anterior and posterior right greater trochanter. Pain initially began in the right lower quadrant and was attributed to endometriosis in 2000. She had undergone six endometriosis surgeries (most recent was 6 months prior, excisional type, no change). She was status post-appendectomy, complete hysterectomy, with left ovary remaining, lumpectomy for right breast carcinoma (7 years prior) and self-referred to our center for evaluation. Pain interfered with sleep; weight was stable, as was bowel and bladder function. There was dyspareunia due to pain upon penetration. There was no loss of sensation or weakness, but her legs weakened when the pain became severe. She underwent trigger point injections and radiofrequency denervation, three years prior, with no relief. Methocarbamol (750 mg; 1 tab, qid, prn muscle spasm). 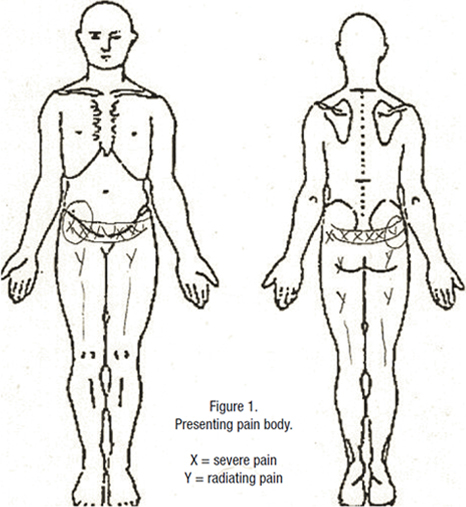 Self-reported symptoms as shown on Figure 1 revealed pain over the anterior and posterior pelvis, radiating down both lower extremities, anterior and posterior aspects, to just above the knees. 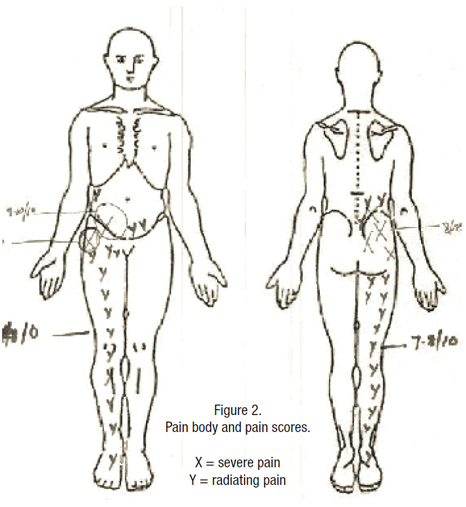 The patient noted the pain indicated on the left was referred or radiating from its mirror origin on the right (as shown in Figure 2). She described the pain as: aching, sharp, tight, pulling, and constant. The pain score intensity range was (lowest-average-highest): 3, to 5, to 10/10, aggravated by prolonged sitting, standing, lying, touching, stress, driving and/or riding in a vehicle, vacuuming, and pulling. The patient found some relief from “self-determination,” pain medication, rest, heat, cold, and lying down in a fetal position. The painful dysesthesias from this region proceeded downward and laterally, anteriorly, and medially. The S1, S2 and S4 dysesthesias proceeded horizontally across the buttock, to the anterior pelvis. The S3 dysesthesias, which were the strongest, proceeded in the same direction as the others, but felt deeper, like a level below S1, S2 and S4, and were more intense. Examination: In examining the abdomen/pelvis, there was diffuse tenderness to the lower hemi-abdomen and pelvis, right greater than left, with mild palpation. The vaginal vault was moist, mildly reactively constricted, but admitted two digits. Upon digital pressure superiorly and to the right, right-sided abdomino-pelvic pain was evoked. In assessing the spine, percussion tenderness was noted from L2-3 to S3-4, greatest at L5-S1. The anterior and posterior loading maneuver (ALM/PLM) were both positive at L5-S1. However, the PLM was more severe, with pain noted to the right coxofemoral and greater trochanter region. Palpation over right sacral foramina and greater trochanter revealed additional hyperalgesia and hyperpathia, supporting the presence of neuropathogenicity. Records review: X-ray of both hips from 3 years prior were noncontributory. A CT Scan of the abdomen/pelvis from two years prior noted previous swelling of the mesentery in the right lower quadrant was not seen, although there was persistent induration in the mesentery (considered: intermittent mesenteric volvulus or internal hernia).